© Brexit Facts4EU.Org 2019 - Full-size clickable charts are below. The UK is set to rival the USA as the EU’s largest export market in the World, eclipsing China. 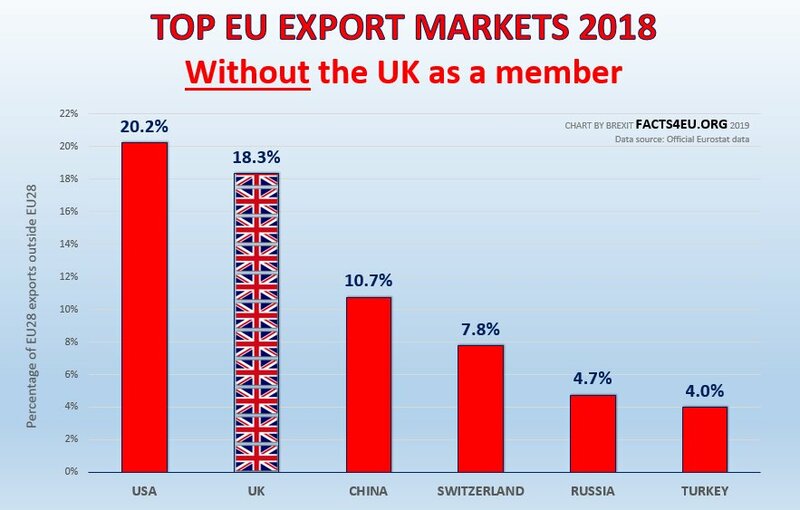 For the EU, based on its own 2018 figures, the UK’s market would have been 71% larger than that of China. Last week, whilst the UK media was focused on politics, the EU’s official statistics agency released its latest trade figures. Brexit Facts4EU.Org now presents its explosive headline analysis. And you don’t have to be a statistician to understand the importance of this. On Wednesday last week the EU Commission published its international trade figures for 2018. Nowhere in the information released did the Commission’s statistics agency refer to Brexit. The reality is that when you take out the UK from the EU’s 2018 figures, the conclusions drawn would be very different. The statistics agency were of course reporting on 2018, and so they were entirely correct in the data they presented. However, last year this same agency started reporting ‘EU27’ data on many subjects, knowing that the UK was leaving and knowing that a large number of people worldwide would be starting to plan for an EU without the UK. 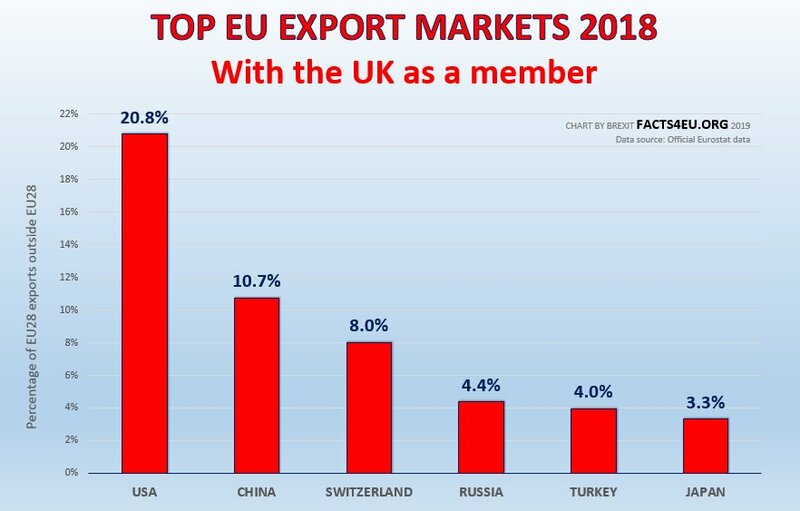 Below we show the top export markets for the EU in 2018, with the UK as a member. We have analysed all the data and so we also show the same information with the UK separated out. In other words, what would the figures have looked like if we had already left? The UK becomes the 2nd-biggest buyer of EU goods in the World. © Brexit Facts4EU.Org 2019 - click charts to enlarge. Our usual caveats apply to all data we research from official EU sources. It is sometimes contradictory, but the above comes from the latest data tables provided. As you can see above, the UK market is vital to the EU27. It is almost as large as the USA and is far more important to the EU27 than China. It is worth bearing in mind that the EU, with its Trade Commissioner having no experience of trade, still does not have trade deals agreed and ratified with either the USA, China, Russia, or Japan, nor with many other key economies from around the world. The UK will be an essential market for the EU27 from the moment the UK leaves. It will immediately become the 2nd largest export market in the World for the EU27. We have been very busy with our public #GoWTO Brexit campaign in the last few days, asking people to send one of our ballot paper templates to anti-democratic MPs. Nevertheless we continue to analyse and report on essential information for the British public and for MPs, insofar as we can. Please support our work if you can, with a donation. Secure and quick payment methods are below. We have no corporate sponsors, nor secretaries or expense accounts. We are simply doing our damnedest on many levels to see the United Kingdom extricated from the mess that is the EU. Very one sided argument as usual. What about the importance of the EU to the UK's exports?? REPLY FROM BREXIT FACTS4EU.ORG TEAM - Neither deal has yet been ratified. Scientist, why don't you refute, instead of opine? You will of course, be using facts to support your refutation. Scientist,I wonder what science you study. Did you not see in the post that they are talking about UK sales to the EU? You are so deluded you can't see what's in front of you.no wonder there are remainders with no idea of how bad the EU is for us. Another good piece that demonstrates why they will stop at nothing to keep us chained to the dying EUtopian dream. Scientists use verifiable facts to prove/disprove theorems (hypothesis may be too big a word for this 'Scientist'). Rather than rebut with facts, they use whataboutery. It's all they have. Whataboutery is just to waste people's time because they're too lazy/thick (delete as appropriate) to factcheck & they have nothing to dispute. So, Scientist, the information that you crave is in the Brexit Index. Look it up yourself. Horror of horrors, the site even quotes its sources, so you can also verify that data with the official sources, which is generally your beloved EU itself. Heaven forfend, there are other places to find this information as well. It's interesting isn't it that 'Scientist' and 'only the truth' are curious enough to venture onto our website to take little potshots at us whilst making it evident that they are both not just completely ignorant of the facts, but in total denial. When they are presented with verifiable/checkable facts, like petulant, spoilt schoolchildren, they will not accept them because it does not fit in with their delusional perceptions of the monstrous EU. Very 'unscientific' and hypocritically, demonstrating that they are simply not interested in educating themselves and have absolutely NO interest in the truth AT ALL. To the scientist (above). Firstly the EU trade deals with Japan and Canada are unlikely increase exports to those countries anything even close to the value of exports to the UK.. Regarding your other point about the importance of the EU to the UK's exports. The key issue is the trade balance. The UK has a massive trade deficit with the EU which means any loss of trade between the EU and UK will provide opportunities for domestic producers. Nobel laureate Paul Krugman estimates for the US that even a 70% fall in trade would only cut GDP by 2%. That's because of the US trade deficit with the Rest of the world. One of the reason imports from the EU will fall is because they will become less competitively priced. Domestic (plus other cheaper no-EU) producers will become more competitive and productive. The same will happen in the EU to UK goods but to a much lesser extent. Also remember a greater proportion of our exports are in Services. Any fall in GDP due to loss of trade will be considerably less than the UK's EU Budget contributions. Given the importance of our economy to the EU, this clearly demonstrates the complete (and deliberate) failure by our Remain Government to properly negotiate to leave the EU with a good Free Trade Agreement. Instead, we have been given May's mad surrender document. They are working for the EU, not for us. Traitors all. Time to throw this Government out. Local elections on May 2nd will be the start, followed by de-selections in Tory 'Remain' MP's seats. Too, an early General Election. Vote the traitors out. Yet another enlightening factual article that will be ignored by our impartial [lol] mainstream media. Theresa May is pursuing a dangerous strategy for her Brexit endgame. Scientist made a very good point. You can't or don't want to answer about the UK's exports to the EU. As far as I'm concerned THAT is ignorance! I heard about the Canada and Japan deal too, so I don't believe for a minute what you say!